Hippo pictures are sometimes a little frustrating to take because they spend so much time in the water. 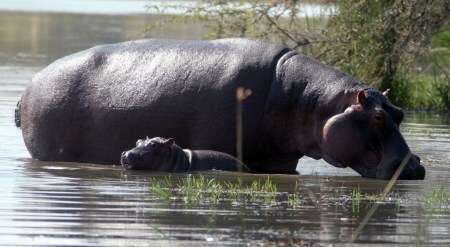 I managed to get this one of a mother and baby at a hide in the Kruger National Park overlooking Lake Panic. 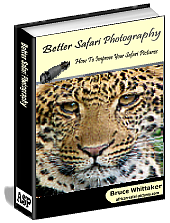 This is a wonderful place for animal as well as bird photography and if you have a little patience you can get some stunning photo opportunities. The hide is positioned over the water which makes it possible to get very close to the action. A long lens is a prerequisite for taking snaps of this aquatic animal because you normally have to contend with a body of water hampering you from getting close-ups. It also takes a lot of patience to get interesting pictures where they are doing anything except floating in the water or sleeping on the shore. One thing I have found is that if you wait long enough you will eventually be presented with the sight of a hippo yawning. This displays of their fearsome looking teeth definitely livens up an image considerably. The yawn normally last only for around a second so you have to stay on your toes. They seem to be a lot more active at night when they search the areas surrounding their water courses for food. Photographing them in the water can be a challenge because normally only the top of their heads and maybe their backs are visible. In a case like that, always make sure that their eyes are in focus because that will be the main interest point of the image. 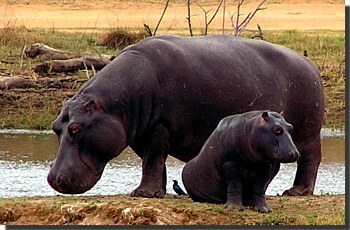 Other factors that will add some interest to hippo pictures is when they interact with other animals around them as they occasionally do with the crocodiles that share their watery living quarters and aquatic birds that sometimes use them as mobile perches. These are the best safari companies in Africa ranked by African Safari Journals using thousands of safari travel reviews.